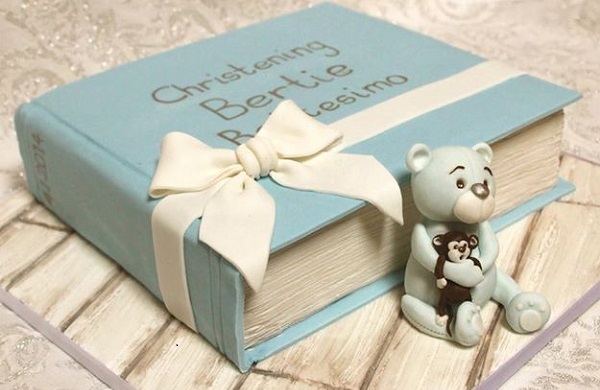 A baby book is a beautiful idea for a christening cake or naming day cake, with a fabulous example above, beautifully finished by Estrele Cakes, Italy. 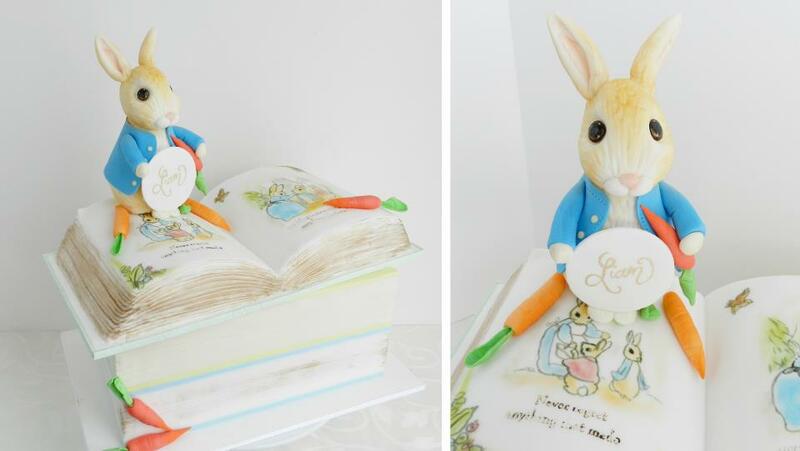 Beatrix Potter books are always a hit with young children and the Peter Rabbit themed stack of books cake below by The Cake Whisperer, Canada would no doubt enchant any little bookworm. 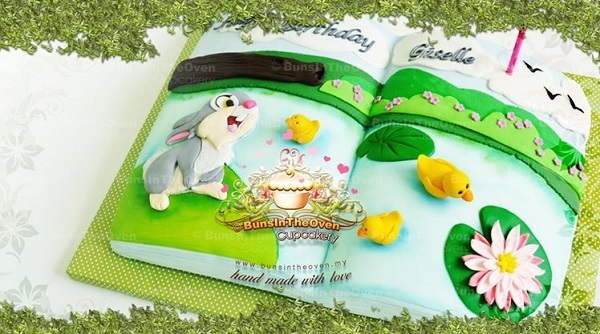 (Starry Delights UK have a great Peter Rabbit tutorial here). 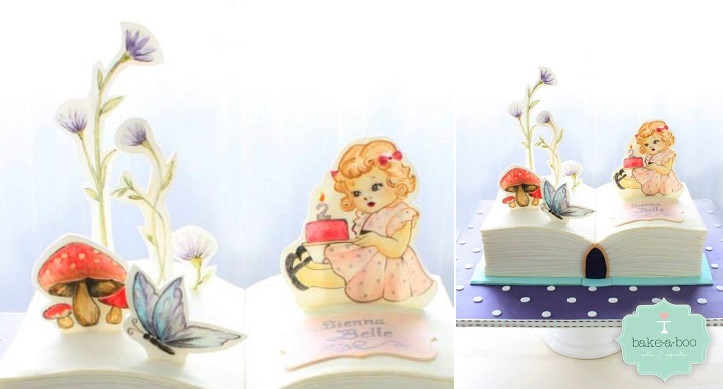 Elina Prawito of Bake-A-Boo Cake Design, New Zealand has put her artistic talents to fabulous use in her book cake design below using hand painted 2-D sugar plaques to illustrate this little girl’s cake to bring the story to life. 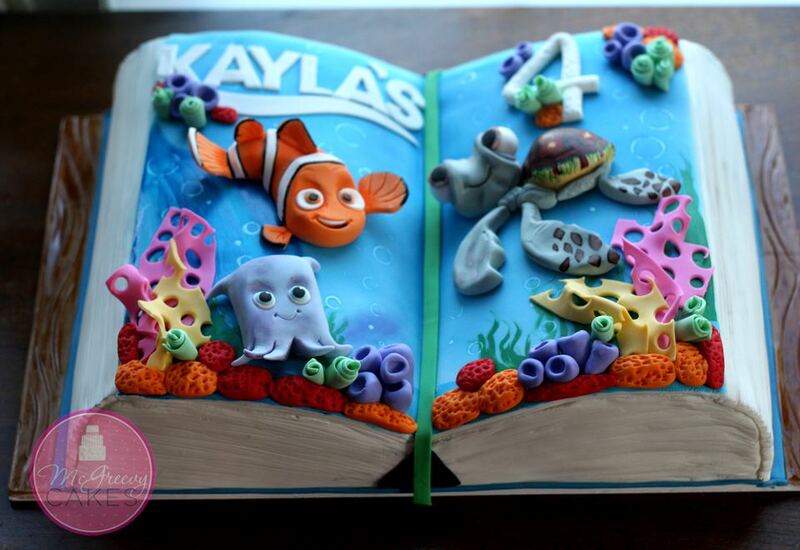 Shawna McGreevy of McGreevy Cakes always brings lots of fun to her cake designs, using 3d sugar models to make the characters in this Finding Nemo cake jump right off the page in an excellently crafted book cake for a little one’s party. 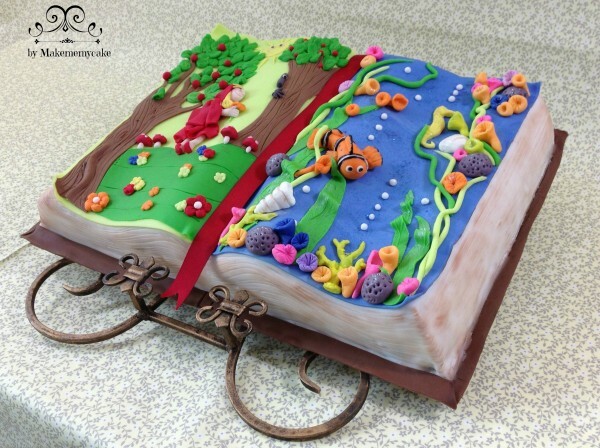 Florida’s Make Me My Cake have used the open book cake format to cleverly depict two favourite children’s stories – one on each page, also in 3-D effect with an “antiqued” finish around the edges of the book adding a wonderfully authentic touch. 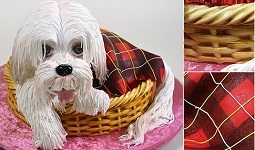 When it comes to creating fabulous children’s cakes, Sheryl Bito of Buns In The Oven Cupcakery never fails to light up a little birthday boy or girl’s eyes. 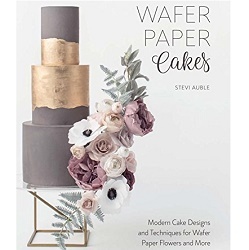 Below, we have one of Sheryl’s beautifully illustrated children’s cakes in book format, in her trademark bright and bold colours. 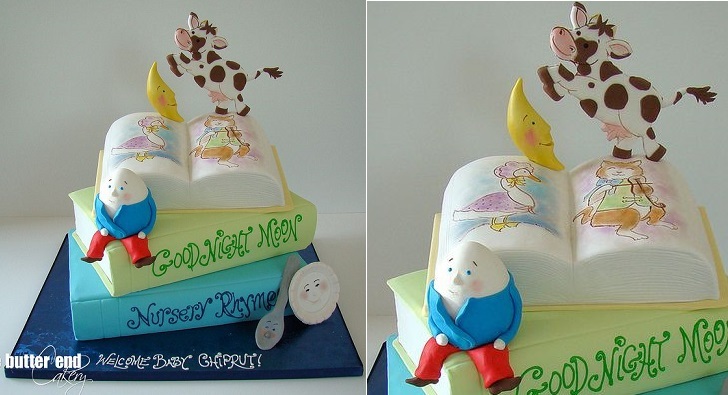 The Butter End Cakery, LA have created a beautiful nursery rhyme cake below with a stack of books brought to life with 3-D sugar models and 2-D elements to delight its little recipient. 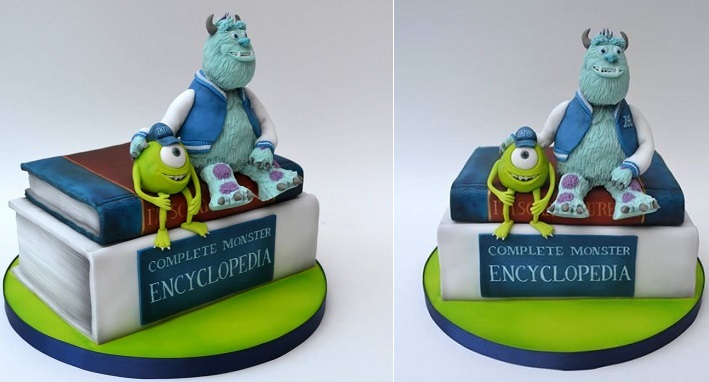 Expert colouring and artwork give the Monster’s University book cake below by Coocakecachoo a superb life-like finish with some fabulous character modelling also. 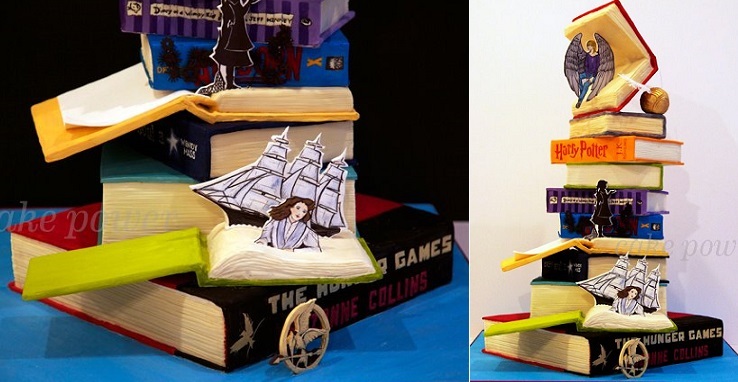 A marvellous book cake design for all ages is the brilliant design below by Man Bakes Cake. 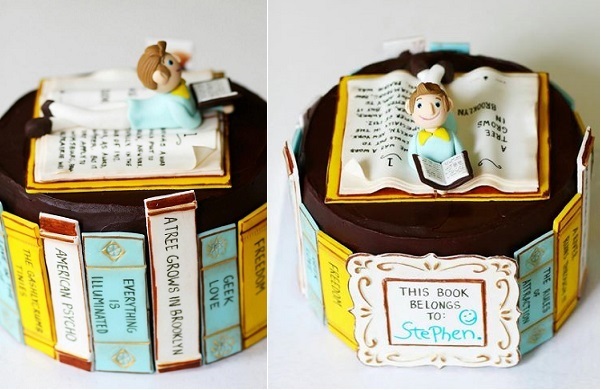 Rectangular sugar plaques are used to create the effect of books on a shelf for a very clever side design, with a fantastic figure model on top stretching out to enjoy his favourite book. 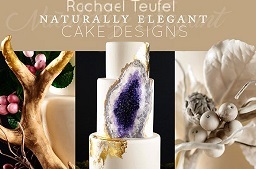 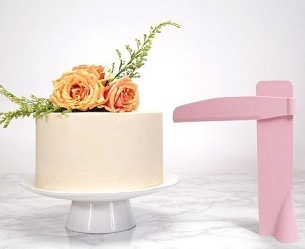 Kate Sullivan of Cake Power, New York created the towering masterpiece below – a wonderful feat of structural cake engineering and artful illustration. 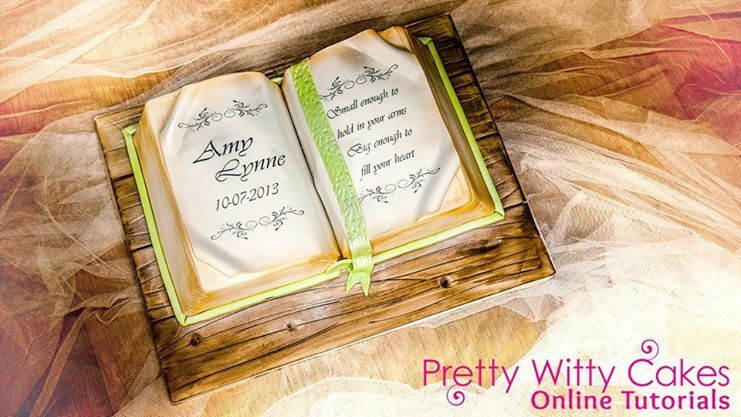 A wise old owl exquisitely crafted sits atop a Harry Potter tome in this wonderful cake by Leslie’s Cakes, UK – a fabulous birthday gift for any little Potter fan. 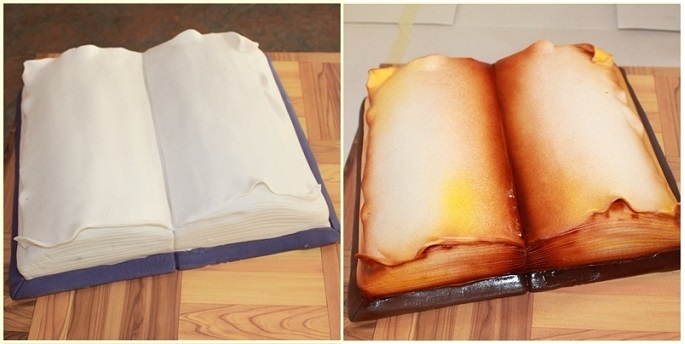 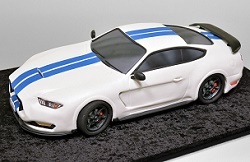 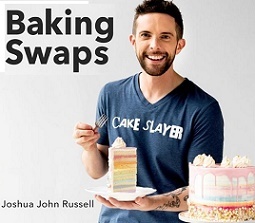 An example of an open book cake below before and after an “aged” effect is applied with an airbrush (image via Juxtapost). 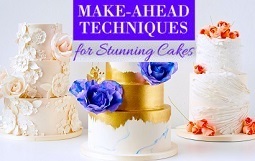 Pretty Witty Cakes offers a tutorial for the excellent open book cake design below including how to create that wonderful aged effect, presented by Leesa Collins of Alice Cakes. 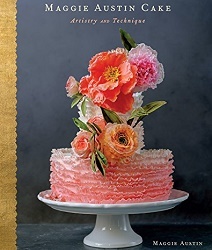 Finally, two exquiste antique book cakes by The Cake Whisperer (below left) and by McGreevy Cakes (below right) – a wonderful gift for an avid book collector. 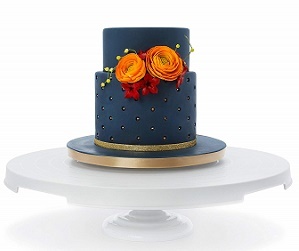 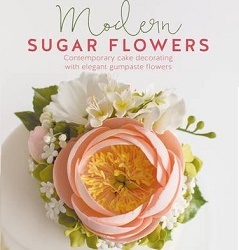 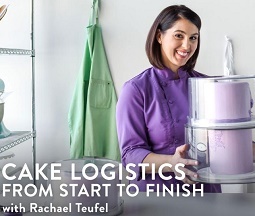 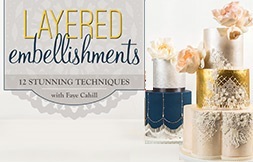 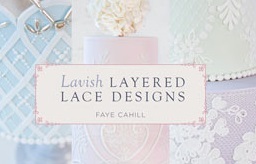 (You’ll find Shawna McGreevy’s edible feather tutorial here if you’re re-creating your own version of her cake). 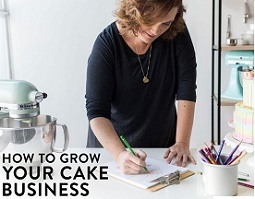 For more tips, tutorials and cake inspiration, just add Cake Geek Magazine to your Facebook “likes” to receive our updates in your newsfeed.